Cerio was making her first pass at the Baton Rouge Regional on Friday, attempting a handspring double front with a blind landing, yet the landing didn’t go as planned and she fell on the mat. Auburn officials have not given a specific update on Cerio’s injuries, but according to Nola.com Cerio dislocated both of her knees and broke both of her legs. The athlete later wrote in an Instagram post that the event was her “final night as a gymnast,” meaning that the injuries she sustained will not allow her to continue her career. “Thank you Auburn family for giving me a home and a chance to continue doing the sport that will always be my first love. I am honoured to have had the privilege to represent the navy and orange AU for the past 4 years with my team by my side. Thank you for letting me share my passion with you,” she wrote in the caption. 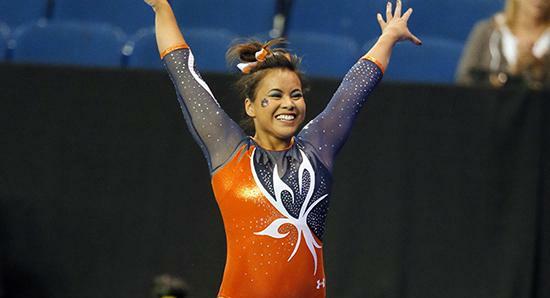 Cerio, who focuses on the floor and the bars, was named an SEC co-scholar athlete of the year shortly before her injury, according to the Auburn Tigers website. The team finished the Friday night competition with an overall score of 197.075, the highest regional score in program history, to advance to the regional final. However, the teammate’s injury might have worn them out emotionally, according to coach Graba, as they finished fourth at the regional finals on Saturday.